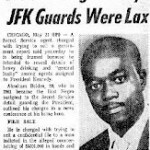 PODCAST: Abraham Bolden, the first African-American Secret Service agent on the White House detail, in a talk from 2008. Recalls his astonishing experience with JFK, with his fellow agents, and the ominous goings-on prior to and after Kennedy’s assassination. A must-listen. Chilling. Also see our recent piece on the Service. A number of curious security breaches have dogged Obama. Are these simply bizarre, random events, or is someone sending someone a message? There’s a military thread running through it all, and we’d be prudent to take a closer look.